Nine IU students joined well over 100,000 other pro-life Americans in the 26th annual March for Life January 22 in Washington, D.C. The march, designed to commemorate the anniversary of the deadly Roe vs. Wade decision, annually draws tens of thousands of pro-lifers to the nation's capital to protest the ruling that legalized abortion through all nine months of pregnancy in the United States. The IU students, members of IU Students for Life, left Bloomington in a van on Thursday, January 21 and returned Saturday, January 23. Three freshman, two juniors, a senior, and three graduate students represented IU in this year's march. Members of IU Students For Life gather in Washington, D.C. (L-R) Matt Minix, Shannon Goings, Liz Lieb, Cindy Dyar, Sarah Reece, and Tony Dale. Prior to the march, pro-lifers gathered in the Ellipse between the Washington Monument and the White House to listen to speeches from various pro-life members of Congress (including Sen. Sam Brownback (R-Kansas), Todd Tihart (R- Kansas), Roscoe Bartlett (R-Maryland) and Chris Smith (R-New Jersey)), leaders of grassroots pro-life organizations, and religious leaders. After the hour and a half rally, the throng gradually began progressing up Constitution Avenue toward the Supreme Court. "It took at least 45 minutes for the crowd to make it out to the street due to the large number of marchers," said IUSFL Vice-President Liz Lieb. "Every direction you looked it was one huge, unending sea of people." 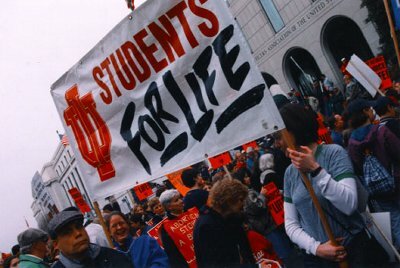 IU students marched behind the IU Students for Life banner, and IU was not the only university represented during the march. Banners from Notre Dame University, Catholic University of America, Georgetown, Boston College, Loras College, Franciscan University, the University of Cincinnati and many other colleges and universities were seen in the march. As the march concluded at the steps of the Supreme Court, large groups of pro- lifers kneeled in prayers on the marble steps while dozens of D.C. police officers stood guard in front of the building. Cindy Dyar (far) and Sarah Reece hold the IUSFL banner among throngs of pro-life supporters on their way to the Supreme Court. After the march, IU Students for Life members and thousands of other pro- lifers filled the halls of the various congressional office buildings to petition lawmakers to take immediate steps to ban abortion. IUSFL members met with a staff member in Congressman John Hostettler's office where the group shared its legislative priorities for the upcoming session of Congress. Those priorities include a more comprehensive ban on all human embryo research, support for a bill introduced in the Senate to ban all abortions, and opposition to legislation mandating insurance companies to cover all forms of birth control---including those chemicals and devices that can cause early abortions. The group also expressed its gratitude for Congressman Hostettler's unyielding support of pro-life legislation. After joining about 100 other pro-lifers in a prayer vigil in front of a Planned Parenthood abortion clinic Saturday morning, the IU delegation began the trek home. "Since we were helping organize the pro-life rally in Bloomington on Sunday, we had to cut our trip to DC short," said IUSFL President Greg Chesmore. "It was certainly appropriate that we ended our time in DC pleading for the lives of babies scheduled to die at an abortion mill. After all, that's what we're fighting against. Abortion isn't just a political issue, it's about defenseless babies dying every day." 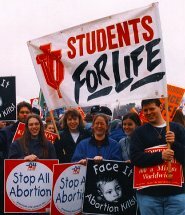 The group made it back in Bloomington in time to join about 200 other pro- lifers at the Monroe County Courthouse January 24 for the 1999 Rally for Life. Speakers at the event included Chesmore, newly-elected State Rep. Peggy Welch (D-Bloomington), Tina Tuley-Lampke of the Crisis Pregnancy Center, and IUSFL Member Sarah Reece, who shared her perspective of the march in D.C. with the rally participants. "It was a powerful four days of speaking for those who can't speak for themselves," said Lieb. "It's important to know that as long as they are killing babies, we won't remain silent."